SPRING VALLEY – Cajon de Oro stayed cool and stayed alive, defeating Brawley, 7-6, in a Little League Baseball 10-12 All-Stars Southern California Section 7 thriller on Tuesday evening. HUNTER KAUL hit a two-run home run in the first inning for CDO. Brawley tied the game with a two-run home run in the seventh inning. TATE CLAPHAM grounded an infield single to third, beating the throw, as JACKSON JUHL scored the game-deciding run. Cajon De Oro fell to Eastlake, 13-6, in the section championship on Thursday despite a three-run home run from LAYTON WIRSHAM, as CDO led 3-2 in the second inning. DANNY TORRES doubled in two runs and in the third inning for a 3-0 lead. A three-run triple by JUSTIN STEARNS extended the lead. Mission Trails fell to Scripps Ranch LL on Wednesday and were eliminated. 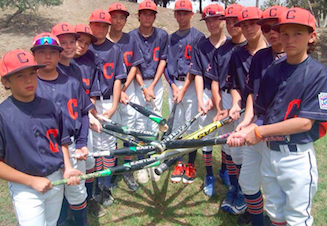 Mission Trails LL had lost its section opener to Encinitas, 15-12. Scripps Ranch defeated Vista American, 14-2, in an opening-round game.